The world football's governing body has launched an inaugural award to honor top divers in the sport. ZURICH — FIFA has announced its intention to launch a new individual award alongside the Ballon d’Or award to honor and remember the drama contributed by cheaters of the sport. 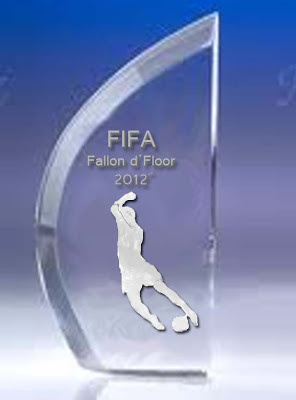 "We have decided to name the award Fallon d'Floor. It's an exciting new award for every player because everybody can have a go at this award," said FIFA president Sepp Blatter when interviewed at his office. "It doesn't matter if you're playing in a top league or a lower league. The more dramatic your fall is, the higher the chance of you getting this award." The full list of preliminary nominees, which was announced yesterday on FIFA's official website, includes Real Madrid’s duo Cristiano Ronaldo and Angel Di Maria, Manchester United winger Ashley Young and Liverpool striker Luis Suarez. Other prominent stars include Sergio Busquets of Barcelona, Arjen Robben, and Fernando Torres. The winner and runner-ups will be given a trophy and cash prizes. All the awards will be presented at the FIFA Ballon d’Or Gala at the Kongresshaus in Zurich on 7 January 2013 during a televised show to be streamed live on FIFA.com and FIFA on YouTube. In addition to the above awards, the recipient of the FIFA Presidential Award and the FIFA Fair Play award will also be revealed during the gala. p/s: this is a fake news.